Morgan Spurlock just can't leave McDonald's alone. During an interview for his latest documentary, "Pom Wonderful Presents: The Greatest Movie Ever Sold," director Morgan Spurlock singled out his former foe, McDonald's, for having spawned the worst-ever example of product placement. In his 2004 documentary, "Super Size Me," Spurlock filmed himself eating nothing but items from the McDonald's menu for a month. And the results were not pretty: He gained 25 pounds and was well on the road to liver failure. The fast food chain scrambled to rebrand itself. For his most recent movie, which opens this weekend, Spurlock sets out to expose the rampant practices of product placement and cross-promotional marketing. Remember E.T. chowing down on Reese's Pieces? That brand saw a meteoric rise in sales following the release of Spielberg's classic. Now just about every blockbuster has a slew of corporate sponsors who, in exchange for promotion, have their brands subtly -- and not so subtly -- worked into the flick. "If you're going to make a movie that you want to reach a mass audience or to be a blockbuster," said Spurlock, "then you need to tie into these corporate partners that will help promote it." So, I had to ask him: What was the most ridiculous, most egregious example of product placement he's ever come across? He didn't have to think long. "Mac and Me," he declared. "It's the worst, worst, worst, worst, worst thing you'll ever see in your entire life ... and it was completely paid for by my good friends at McDonald's." The movie, which came out in 1988, is infamous among connoisseurs of cinematic schlock, who rank it alongside the likes of "Troll 2" as one of the worst movies ever made. The film is about a freakish-looking alien named MAC (an acronym for "Mysterious Alien Creature") who ventures to earth, befriends a wheelchair-bound lad and discovers a boundless love for McDonald's. The high point (or low point) of the movie is a staggeringly cheesy five-minute dance sequence in the middle of a McDonald's, featuring an appearance by none other than Ronald McDonald. "It's ridiculous. One of the most ridiculous things I've ever seen in my life," said Spurlock. "I wish I had been in that meeting, because you know what happened," said Spurlock. "You know they were sitting around a conference room somewhere, and somebody had the brilliant idea and said, 'You know what the kids like? The kids love that E.T. So you know what we should do? We should have an alien come to Earth. But instead of Reese's Pieces, he loves McDonald's." For "The Greatest Movie Ever Sold," Spurlock decided to make his documentary on product placement by having it funded entirely by product placement. "We actually had brands come in and pay for us to pull back the curtain and actually show how the sausage gets made," he told me earlier this week. At the time he was wearing a business suit studded with corporate logos, NASCAR style. "We're not selling out; I'm buying in." 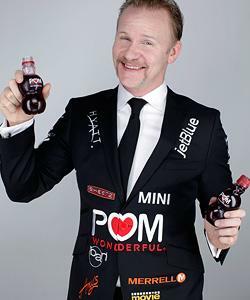 In the film, Spurlock manages to get his movie poster on Hyatt hotel room keys, tags on bottles of Pom Wonderful pomegranate juice, and on collectors' cups from "Sheetz" convenience stores. In exchange, he features these products prominently in his doc. At one point, there's a stick of Ban deodorant placed in front of Quentin Tarantino as he is being interviewed. In another scene, Spurlock shills the qualities of Merrell shoes to consumer advocate Ralph Nader. The sponsors that put up the most money even got a commercial right in the middle of the movie, while the largest sponsor, POM Wonderful, even got naming rights to the film. Yet there were numerous brands that were flatly uninterested in partnering up with Spurlock, fearing his reputation based on his earlier work. "I wanted BP to be the official gas station of 'The Greatest Movie Ever Sold.' So we called them. I said, 'Listen, this would be great for you guys. You could use a real kind of boost of positive press right now.' And they said, 'No, we don't want anything to do with this.'" Spurlock might have been shamelessly, gleefully flogging the brands of his corporate partners, but there was one area he was not willing to sell out on: He insisted on retaining the final cut of the movie. "When you lose that control, you're not telling an honest story. You're telling a story that someone else is paying you to tell versus following your own artistic vision. The fact that we were able to retain that control made the world of difference." Whether or not "The Greatest Movie Ever Sold" has the same box-office impact as "Super Size Me," the process of making the movie has opened up some unexpected doors. "Word is going to start getting out about the film within the advertising/marketing community that I was brand-friendly," he said with a wry smile. As a result, he's been asked to work with Jason Bateman and Will Arnett in a movie about male grooming. intriguingly, what its corporate partners might be .